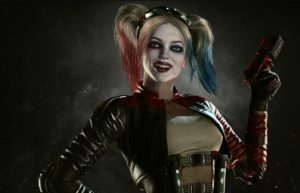 This page contains a character guide for Harley Quinn in Injustice 2. Here you’ll find movelists, combos, juggles and strategy guides and recommended gear for the Hero character. For more Injustice 2 content, head over to our Injustice 2 top page. Harleen Quinzel was a criminal psychiatrist, who was seduced by her patient: the Joker. She abandoned her career and became Harley Quinn, the Joker’s ditsy sidekick. Quinn is willing to do anything to please her “Puddin,” even murder. Though as normal as any human can be, Harley Quinn is a highly dangerous and unpredictable fighter thanks to her years of serving as the Joker’s right hand woman, her sanity having eroded away and leaving a madwoman where there was once a professional psychologist. Much like her Mr. J, Harley is a lithe, agile opponent, possessing a high skill of gymnastic level of acrobatics, allowing her to move quickly around the battlefield and all over her opponent for close range attacks. Below are combo and juggle inputs for Harley Quinn , including corner strategies and restarts. Harley Quinn is a well balanced character in Injustice 2. She is a Gadget user and most of the environment interactions of the things around various stages can be used to her strategic advantage. With most gadget users, they jump/ make use of the items they can interact on stage. Harley is a very good character to play with. Her character power can make set-ups for her to do her combos and can help in making positions for your opponent to double think what your next move will be. In addition, Harley can be a well balanced character to practice your juggle and grab timings when you set-up combos. Furthermore, Harley can be a character that can be fun to play with if you like playing with your opponent and not worrying too much about your situation on the field. It is highly recommended to take advantage of practice mode to further utilized her combos and set-ups to make proper juggle combos. If playing against her, it is best to know the timing of her set-ups. In addition, it is also best to either run her down as some of her moves are quite slow. Some may even rely on her character power and range special moves (such as the Pop Pop, Cupcake Bomb and Pistol Fury), it would be best to get close and not give her the chance to utilize her moves and close the gap between you. Harley Quinn wears a purple and red modified boyfriend cardigan with a diamond pattern at the bottom held together by brown leather straps. She has a domino mask and a necklace with a joker card. She also has brown straps wrapped around her right arm and gloves that go up to a little under her elbow. She wears purple briefs and purple and red leggings with a diamond pattern on them. She has shin-high black boots. Her hair is in pigtails and is two toned (red/black) with the black half taking on a green tint due to the mixture of the dye color with her naturally blonde hair. Harley Quinn wears a red and black jacket that exposes her torso and underarms, with the words “Kiss This” written on the back. She wears a white shirt with a Joker-like smiley face on it, black and red padding on her arms, fingerless gloves, and a choker necklace. She has a small brown belt and red and black leather pants with black boots. Her hair is in pigtails, wrapped in red (left) and black (right) fabric, and is blonde. 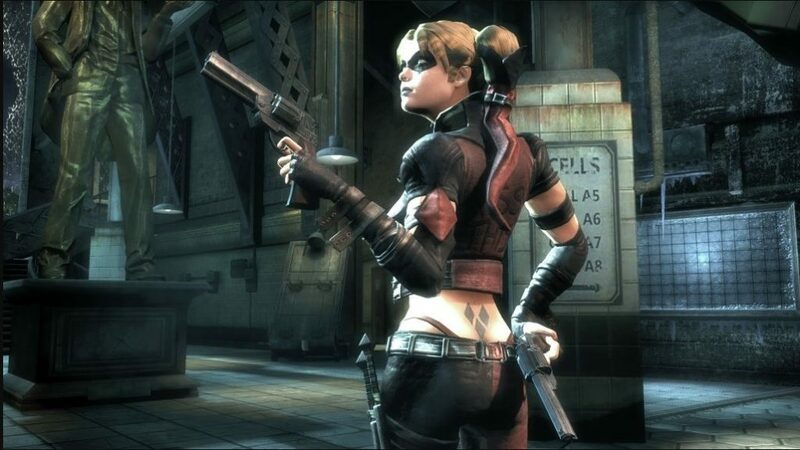 Tara Strong previously voiced Harley Quinn in Batman: Arkham City. Harley Quinn was originally created for Batman: The Animated Series and was later adapted into DC Comics Batman’s comic books. According to concept art Harley’s pet hyenas Bud and Lou were considered to be in the game and maybe even a part of her gameplay but they never appeared in the final design of Harley and her move set. They appear as an unlockable icon for completing all of Harley Quinn’s S.T.A.R Labs missions. However, they do appear in Injustice 2. Harley Quinn is, comic debut-wise, the youngest character in the game, having made her debut in September of 1993. 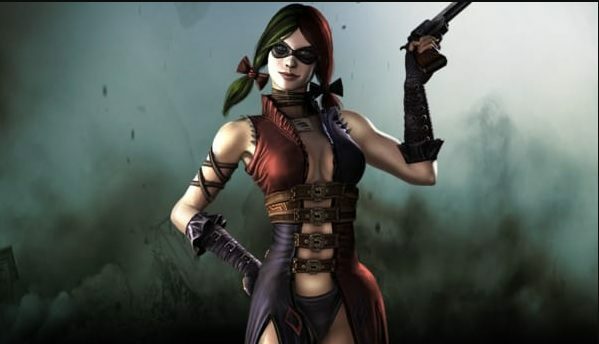 Harley Quinn’s original costume appears in the Injustice: Annual issue, making her the second character to have her original costume appear in the series alongside Superman. I simply wanted to send a brief word in order to say thanks to you for these nice guidelines you are writing on this website. My extensive internet lookup has now been honored with incredibly good concept to write about with my friends and family. I would state that that we readers actually are rather lucky to exist in a fabulous place with many awesome people with very beneficial strategies. I feel somewhat grateful to have seen the website page and look forward to tons of more exciting times reading here. Thank you once again for all the details.